“Leisure Tank” is a London/Berlin based Duo. K.C. McKanzie on electric guitar and vocals and Budi on drums. 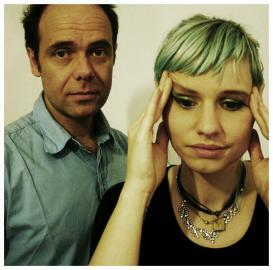 Their song “Isabella”, a swirling rocktune full of jealousy and obsession was chosen by “FreshOnTheNet” as a favourite and described as “gripping indie rock at it’s best” as well as compared to PJ Harvey’s “Rid of Me”. “Leisure Tank” is a new beginning for long time collaborators K.C. and Budi. They have toured Europe for 8 years as folk duo “K.C. McKanzie” (formed in 2004) and released 3 albums. The band was forced to pause when K.C. moved to London in 2013. “We were touring all the time, we played about 100 shows every year and suddenly I found myself in a room full of instruments and time on my hands.” K.C. explains. “But instead of writing the next folk album I took to the electric guitar and a little simple loop machine and started experimenting with rhythms and sounds.” The singer then began playing intimate solo shows in London describing the switch to the English audience as “refreshing”. When asked about her band mate Budi giving up the Double Bass and playing mostly drums from now on K.C. laughs: “I feel a bit sorry for Budi because he learned the double bass for me. When we first met he was a drummer, he played drums since he was twelve years old. But my music was so quiet and shy. He wanted to be part of it so badly that he began playing the double bass. And now I asked him to bring out the drums. It took me a while to convince him, but as soon as we started rehearsing the new songs we had so much fun.” They recently recorded 3 songs at the Space Eko East London recording studio in a drum-and-guitar-session. “These recordings really capture what I had in mind when I wrote the songs. They are raw and loud and very dynamic. I’m sure that when we will record another album we will add more sounds and instruments though.” Says K.C.. The Duo will focus on live shows in the next few month and works on more songs. The three recorded songs “Isabella”, “WetSuit” and “Shadow” will be released online. I am very sure their audience will grow in the near future and we will hear more soon from “Leisure Tank”.